The roof is probably the most important system in the building design. It keeps the house warm, dry, and safe from the elements. It’s also a very expensive feature of a home to replace when it wears out. The roof system is comprised of shingles (or another material), wood sheathing nailed to rafters, the rafters or roof frame, then insulation and finally the finished living space. All of these components are adversely affected by rain and snow so it’s important that the shingles are in good repair. A roof that isn’t water tight will allow rain and snow to penetrate the building envelope compromising the interior. Water will cause premature decomposition of the wood supporting the shingles, which may affect the structural integrity of the building. Once the attic space is damp, mold can grow on any material including fiberglass insulation. Mould is a significant health hazard. A well-maintained roof will last 20, 40 or even 60 years depending on the materials used. A high-performance asphalt shingle roof is one of the most common installations. 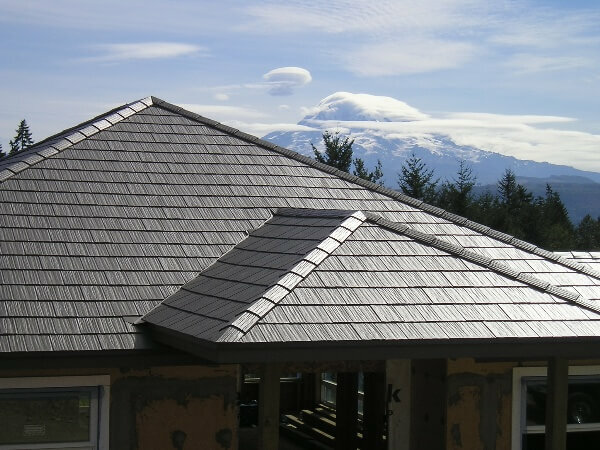 Standing-seam metal rooves are becoming more popular and are not maintenance free although many assume they are. They require regular inspection for unusual wear, corrosion, and seam separation. Because the roof is out of sight, out of mind, it’s often ignored until something goes wrong. When inspecting the roof, look first inside the home for stains on the ceiling. Then check the attic for signs of leaks. Can you see sunlight from inside the roof? Check to see if the sheathing is stained or has soft spots that will indicate rot. How does the attic smell? Is it well ventilated and fresh? Or is it musty and humid? Next, inspect the outside appearance. As asphalt shingles get old the edges will curl instead of laying flat. Sometimes shingles will crack or fall off. Check the gutters for granules, the gravel on the asphalt that protects it from wear. If there are granules in the gutters it might be time for a new roof. A sagging roof is a sign that there are structural deficiencies in the framing or even the foundation. Your home inspector should be able to spot roof problems and if necessary, call in a qualified roofing company to give you an estimate for repairs.